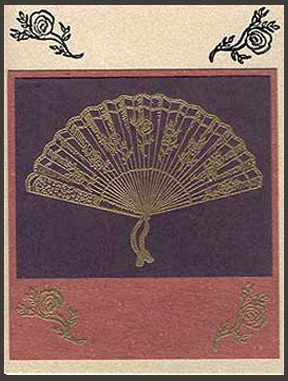 “Rose Fan, Lg.” is stamped and embossed in gold on dark brown card stock and cut to fit the top of rust colored card stock which has been embossed in gold on the lower section with “Carved Rose.” A larger piece of parchment card stock is embossed in black at the top and all are layered. Card by Tammy Dunlap. “Picket Fence” is stamped on white card stock, colored with markers and cut out. It is then layered on striped vellum which has been layered over medium blue and sage green card stock over yellow card stock which has been glued to the gray blue main card stock. 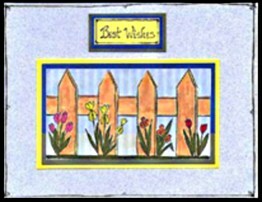 “Best Wishes #2” is stamped in black on yellow card stock which is layered on medium blue and sage green and glued above the fence on the main card stock. 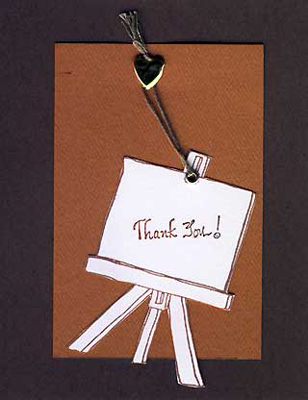 The finishing touch is to draw connecting lines around the words, “Best Wishes” and the border of the card adding “x”s at corners and three dots near the middle of each side and at corners. Card by Tammy Dunlap. 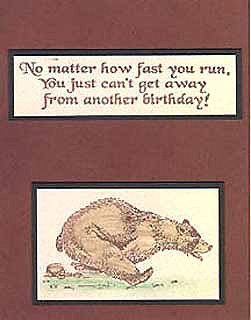 “Scootin’ Bear, Lg.” and “No matter how fast…” are stamped in brown on ivory card stock. Scootin’ bear is colored with pencils. Both are layered on dark brown and rust card stock. Card by Tammy Dunlap. “Happy Birthday to Ewe! 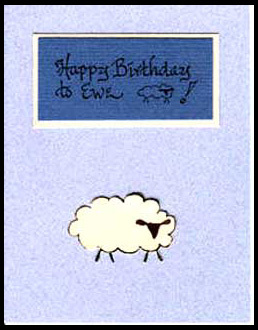 (with Ewe)” is stamped with black ink on medium blue card stock and layered on white, then light blue card stock. “Lamb #1, Lg.” is stamped with black ink, cut out and foam mounted on the light blue card stock. Card by Tammy Dunlap.